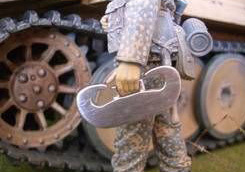 1/16 German Tank Large Metal C Hook Discounts Apply ! 1/16 German Tank Large Metal C Hook. Add that extra detail to your 1/16 model or RC tank with these very detailed metal part. Each piece can be painted and weathered. Great for King Tiger, Tiger I, Panther Jagdpanther and any large german tank. 1 each.